The 2017 update of the report identifies 7 companies involved in the production of (key components of) cluster munitions. 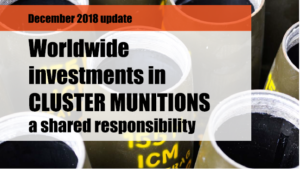 There are more companies involved in the production of cluster munitions, but our report only mentions the ones that we find investments in through the databases that we use for our research. We found a total of US$ 9 billion invested in these 7 companies. The Israeli cluster munition producer IMI Systems was acquired by Elbit Systems in November 2018. As of early October 2018, the takeover was in its final stages. We found no financial links with IMI. However, PAX calls on investors in Elbit Systems to divest from the company unless it announces it will stop producing cluster munitions as soon as the takeover of IMI systems is finalized. Orbital ATK (now part of Northrop Grumman) and Textron are no longer listed as cluster munition producers, after the production and delivery of Textron’s Sensor Fuzed Weapon was completed. However, both companies still engage in maintenance activities related to cluster munitions. We call on investors to engage with both companies to make it sever all involvement with any activity related to cluster munitions. The goal of our research is to show the involvement of financial institutions worldwide in companies that produce or develop cluster munitions. Before we identify these financial institutions, it is important to have a clear understanding of what we mean by cluster munitions and how we define a cluster munitions producer. Any company or group of companies that, in its own name or through a subsidiary, develops or produces cluster munitions and/or explosive submunitions according to the definitions in the Convention on Cluster Munitions, or key components thereof. Key components are components which form an integral and indispensable part of the cluster munitions or explosive submunitions. We consider a company or group of companies to be a cluster munitions producer when any part, however small, of its total turnover is derived from producing (key components for) cluster munitions or explosive submunitions, regardless of the nature of the company’s other activities. We do so, because most cluster munitions are produced by companies that also produce other defence and/or civil products. Companies and groups can easily reallocate capital internally; profit from one production line can be invested in other production lines; money for general corporate purposes can be used for any of the company’s activities, etc. Focussing solely on financing for cluster munitions is impossible and undesirable given the companies’ financial structures. Moreover, even if a company only gets 1% of its turnover from cluster munitions, this 1% can represent a considerable amount of money and can mean the production of large amounts of cluster munitions. 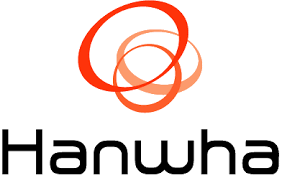 – the company has not stated publicly that it will end its involvement in the coming 12 months. A clear description of a contract for or delivery of the product in a company publication or trade journal is considered as sufficient evidence that a company is involved in present or planned production. This is also the case when a budget line for the product is included in a recent government budget. If over the past year the company has advertised (key components for) cluster munitions or explosive submunitions at exhibitions, in brochures, or on its website, this is seen as evidence of development or production. However, if other evidence is found that contradicts this or if the advertising refers to (key components for) cluster munitions or explosive submunitions that, to our knowledge, have not been produced since 30 May 2008, we do not place the company on the long list. As a consequence, some companies which mention (key components for) cluster munitions or explosive submunitions on their websites are not included on the long list. A brochure may date from before May 2008, or other evidence may suggest that these products are no longer being produced. Furthermore, some companies that may produce (key components for) cluster munitions or explosive submunitions at present are not included on the long list because we could not find sufficient evidence of their production activities. The research was done by the Cluster Munition Coalition, research consultancy service Profundo, Omega Research Foundation and PAX. We contacted all of the producing companies on the Red Flag List. When they provided additional information, we refer to it in this report. For all cluster munitions producers on the long list we researched if financial links with one or more financial institutions could be confirmed with reliable information in the public domain. When we could find no links to financial institutions, we have not included the cluster munitions producer in this report. This was mostly the case with state-owned and privately owned companies. Because these companies are not taken into account, the short list of companies in this report can by no means be considered an exhaustive list of the companies, worldwide, involved in the production of (key components for) cluster munitions or explosive submunitions at present. There is still a marked lack of official information available in the public domain about the production of cluster munitions. There may well be companies that currently produce (key components for) cluster munitions or explosive submunitions that are not on the Red Flag List simply because we could not find sufficient evidence of their production activities.